In November 2008, 10 machine gun-toting terrorists attacked several hotels and other locations in Mumbai, India, killing 165 and wounding 308 in a grueling, four-day siege. 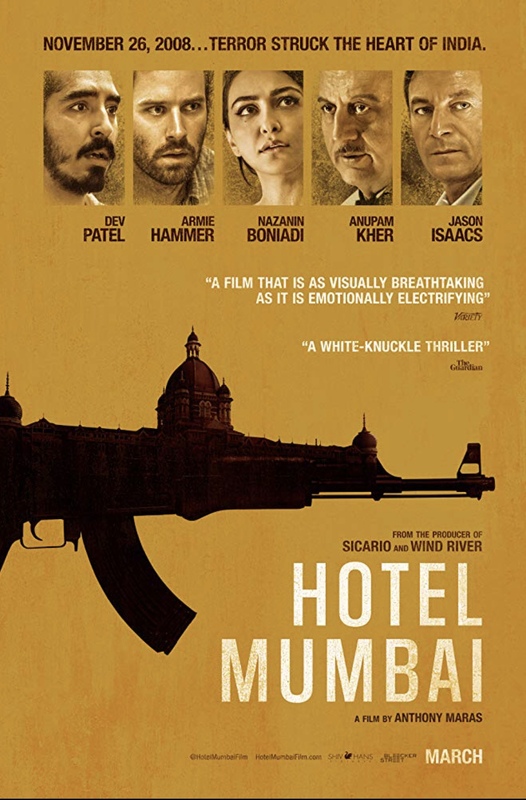 This film focuses on what happened at the city’s famed Taj Mahal Palace Hotel. There is always the risk that films such as these will be exploitive and offensive to the memory of those who endured such tragedies. That is not the case here. 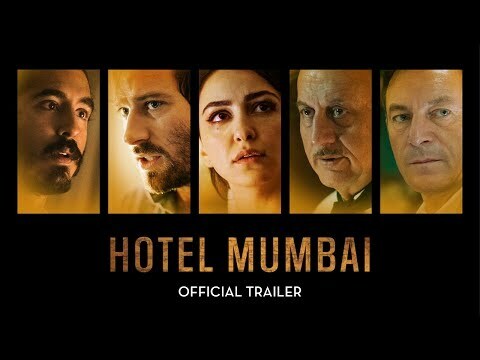 This immersive film is an incredibly realistic, intense, pulse-pounding thriller, showing the horror of what transpired and the tremendous bravery of hotel workers who stayed, risking and even sacrificing their own lives to help save guests. Co-writer/director Anthony Maras maintains a gripping, nonstop pace, with strong performances from Dev Patel (Slumdog Millionaire, Lion) as an employee trying to save guests, and Armie Hammer (Call Me By Your Name), Nazanin Boniadi (Homeland) and Tilda Cobham-Hervey as a couple and their nanny trying to save themselves and their infant child. (The baby’s frequent cries, threatening to expose their whereabouts, is a frequent, frustrating reminder of the helplessness of the situation.) The film is incredibly harrowing, at times even difficult to watch, but it is an important and exceptionally well done reminder of just how quickly a terrorist event can occur, changing people’s lives forever. • Much of the terrorists’ dialogue was taken verbatim from cellphone conversations authorities intercepted during the actual four-day siege. • Actress Tilda Cobham-Hervey replaced fellow Adelaide, Australia native Teresa Palmer (Lights Out, Hacksaw Ridge) as nanny Sally after Palmer had to drop out of the production due to her pregnancy.